An ever increasing investigative caseload due to our consistently high level of granular specificity has Watson and I gourmandizing the Atlanta restaurant scene more often than in all the years past combined. Our miscible observations to date are that 'Hot'Lanta' has as robust a gastronomic enterprise as any we have ever enjoyed anywhere with no shortage of fine banquet halls, excellent gastropubs, sterling bistros and cafes, exceptional steak and chophouses along with a very healthy plethora of those individually unique locations that hew closely to the locally grown and sourced integrants with their disparate eclectic dishes all served up in spectacular fashion. Let it be here pronounced that Atlanta's Wisteria is just such a place! Found in the curvilinear Inman Park area just east of downtown Atlanta, this evenings case again involved our amenable neo-Georgian's Prince M. William and Lady Elizabeth, our new confidants in this region with both now involved in the higher echelonic machinations of Emory University. And it is primarily due to their recent relocation here that we have quickly been drawn into over two dozen highly intriguing candidates for our espiance...and much to our delight I might add! With its lush and rolling geography the Inman Park area was originally envisioned as an oasis for city-dwellers by landscape designer and city planner Joel Hurt in late 1880's, a time when Watson and I were working on our own thriving investigative practice at 221B Baker Street, London. Named for his business associate and compatriot Samuel Inman, these twisty roads were designed to yield visitors a relaxed view of the expansive greenery and (after many changes in the last 100 years both economic and gastronomic) the region is again experiencing a vibrant resurgence with a very healthy quantity of top class eateries festooned throughout the region. While parking can be a tad vexing in the fairly tight Highland Corridor, the harried visitor (or soon-to-be satiated patron) can surely come up trumps with the free valet lot next to Wisteria. The tight streets belie the fact that the Jimmy Carter Library and Museum, in the wide open and expansive Freedom Park greenway, is just some 1000 meters (yet an entire world) away to the west. 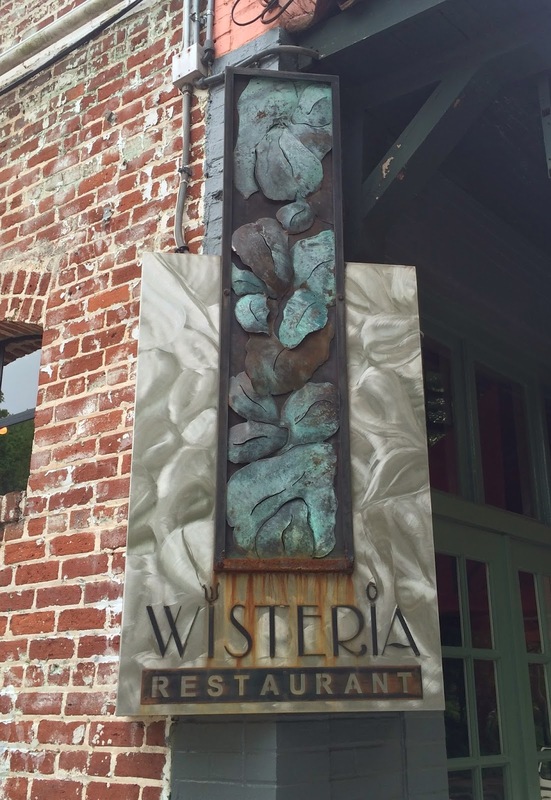 Wisteria is housed in the end unit of a single story row of shoppes with brickwork more than 100 years old and the architectural use of said brick inside parlays this decor to its sure advantage. The pub wall is aptly backed by an expanse of this original brickwork .... and as justly, throughout the enclave one finds the contemporary touches of local artists adorning the walls as well. 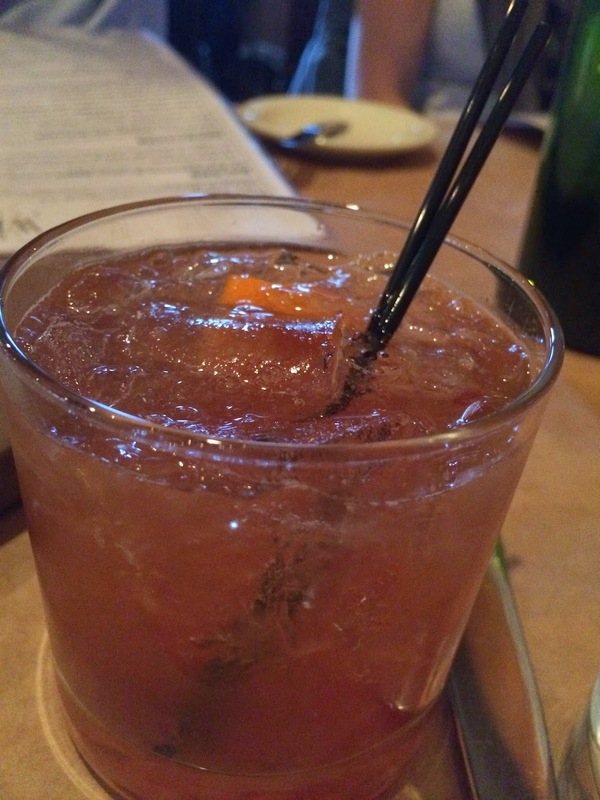 This clean, neat, sometimes classical interior proffers the proper mix of old world southern charms with a modern interpretation of style and grace and only begins to prepare you for the taste melange that awaits your palate. Intriguingly, the menu is not just the beguiling twist put on southern staples like 'Shrimp and Grits' that begins to alter the provisional balance here in the New South, although that too is especially good here. No, it's more that 'Contemporary American Fare' is deftly served with a uniquely updated Southern flair and that these offerings from Chef-Owner Jason Hill are quantifiably on par with the finest available anywhere. To our great benefit! Now, with every good dasher sporting a healthy and eclectic mix of slakes and libations these days, Wisteria is well represented herein as well for the Breckenridge Bourbon Old Fashioned I thusly summoned was among the best I have ever sampled and, with a semi-coherent belief that it MIGHT have been a mere distilled fluke, I had to have another for veracity! Properly wetted, and to aid in our primary entree decision making, the Prince suggested we draw on an order of Fried Calamari appropriately dredged in cornmeal from the local Red Mule Mills (where said cornmeal is in fact ground locally by 'Luke', the eponymous 15 year old Red Mule himself). Served with a Sweet and Sour Apricot Sauce and a Wasabi Creme Fraiche, this delivery skillfully gives one the Southern Twist initially sought out while also delivering a delicious starter for our small cluster. It was almost too much for us to order only one 'taster' as there were a number of others that looked especially appetizing: the Ancho Chili Rubbed Sea Scallop, Flash Fried Gulf Oysters in a Sherry Cream Sauce, the Beef Carpaccio along with a tantaric Salmon Tartare Flatbread. However, Watson is not much for these early invitationals and a grumbling belly soon pushed us to quickly know our onions. What initially appeared as a limited list of 12 main plates soon showed itself (upon finer inspection) as a very well balanced assortment of dishes with all bases seemingly covered: Six were water related in some way, two beef involved, one pasta friendly, one of fowl, one of foal (lamb), and one completely vegetarian... it was a poetic balance. On this night it was the Pan Fried North Carolina Flounder ($27) with herb spaetzle, baby spinach, pink lady apples, and lemon butter pan sauce that caught the eye of both Watson and the Prince while Lady Elizabeth opted for the delightful Black Pepper Crusted Grilled Salmon ($26) with little gems lettuce, Asian pear, farm egg, curried candied pistachios, and filled creme mousse. The descriptions alone were more than our senses were prepared for but their gift was in the water generating aromas given at delivery. As a self-avowed trout aficionado I chose the Almond Crusted Georgia Mountain Trout ($21) with green beans, corn, roasted tomatoes, fingerling and red potatoes, and bacon vinaigrette. It wasn't perhaps the most picturesque delivery but the succulence was palpable. And it should be noted that trout can be served in many ways yet this was a heretofore unique amalgam. Relying on our exemplary waitperson Rob(ert) to deliver us an additional two accompaniments to complement the orders received thus far - he did not disappoint. A simply scrumptious Sweet Potato Mash with Candied Pecans($6), which we certainly would not have ordered but were instantly astounded at with its nuanced pleasure, and the Braised Greens Mac n' Cheese ($8) which has now attained a perch in our collective side-dish hierarchy of Best Ever! Simply superb! It should also be noted that a seemingly small matter to some but huge in our investigations is the presence of teamwork in any enterprise, where all are clearly rowing in the same direction to further the efforts of the whole. At Wisteria it was the subtle drink delivery by a previously unseen steward, a quiet whisking of plates by another that showed us ethereal web intricately woven beneath the surface aiding the entire operation. A well run endeavor indeed and certainly not one glossed over. And once dining plates do disappear the timing of the desert introduction is also another sign of measured expertise; not rushed or dallied yet smoothly enveloped in like that far-off oboe singing during an intricate classical symphony. Heavier meals in other locales might call for a digestif along with a final plate yet the light fullness of these meals suggested something perhaps with a bit of frippery. The Small Bites Desserts, which offered three of the eight full dessert parcels in more moderation (3/$10 or 6/$18), is the perfect communal table piece allowing social participation yet discreet restraint at gluttony. Our chosen delightful trio consisted of the hand crafted Caramel and Sea Salt S'more, Chef Walker's Seasonal Granita - this one of Pink Grapefruit and Fresh Ginger(! ), and Jakes Homemade Ice Cream - tonite a Mexican Chocolate-Salted Bourbon Pecan-Vanilla Bean melange that was cool, soothing, and yet had a bite to it that rightly startled! Overall Wisteria sports one of the largest gluten-free menu's in the area, hosts a large array of locally ground and sourced raw ingredients, and is constantly changing based on the availability of these fresh ingredients so that the listed menu rotation will be ongoing yet the excellence with which it is served will certainly be everlasting if our experience is any harbinger. The unique nature of the evening was brought to a pointed when upon retrieving our coach outside we saw what appeared to be a Sunbeam Tiger, a 1964-67 production aided by Carroll Shelby who also designed and developed the quintessential AC-Cobra, an automotive gauntlet whose throttling reverberations are documented in auto auctions worldwide. This 'Tiger', witnessed for the first time, was unlike anything we'd seen ever before - just as Wisteria was a find like no other!